Intervista a Keith Shepherd co-fondatore di Imangi, società americana del famosissimo gioco Temple Run, che conta più di 170 milioni di download tra iOS e Android, ci racconta come, con un team di poche persone sono riusciti a costruire un brand così forte come quello di Temple Run. Imangi Studios is still a small, independent developer. 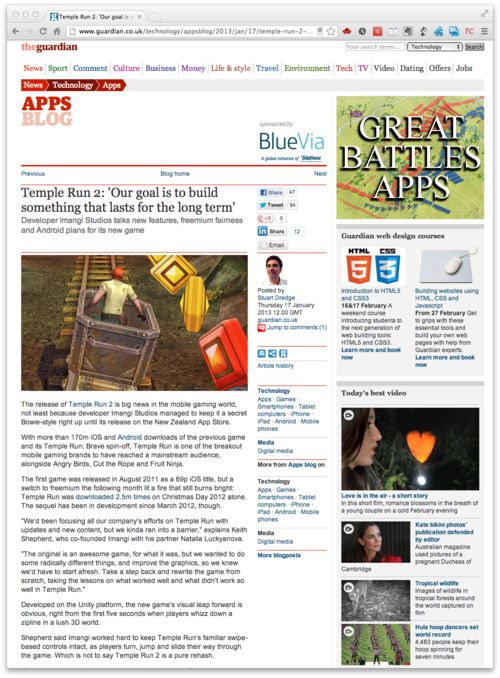 Temple Run was the work of a three-person team: Shepherd, Luckyanova and artist Kiril Tchangov. The sequel was made by five people: that trio plus Jeff Ruediger and Pete Parisi from FuzzyCube Software. 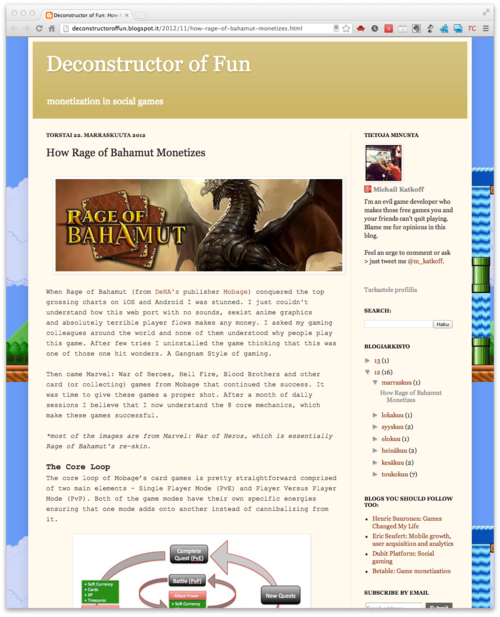 Un interessantissimo articolo che chiarisce, analizzando minuziosamente ogni core element del gioco, il successo straordinario raggiunto da Rage of Bahamut e tutti i suoi cloni fatti da Mobage. With Rage of Bahamut, Marvel: War of Heroes, Hell Fire, Blood Brothers and other similar titles Mobage has succeeded to hook and monetize players around the world. The success of these titles seems very odd as there’s no stunning graphics, extreme polish or new and exciting game play modes. But once you give some time to these games you’ll understand that their success is based simply on our natural need to collect and compare what we have with other collectors around the world. Se state pensando a come sviluppare il tutorial per il prossimo gioco questo video potrebbe darvi qualche suggerimento su come procedere nel design e nell’implementazione.